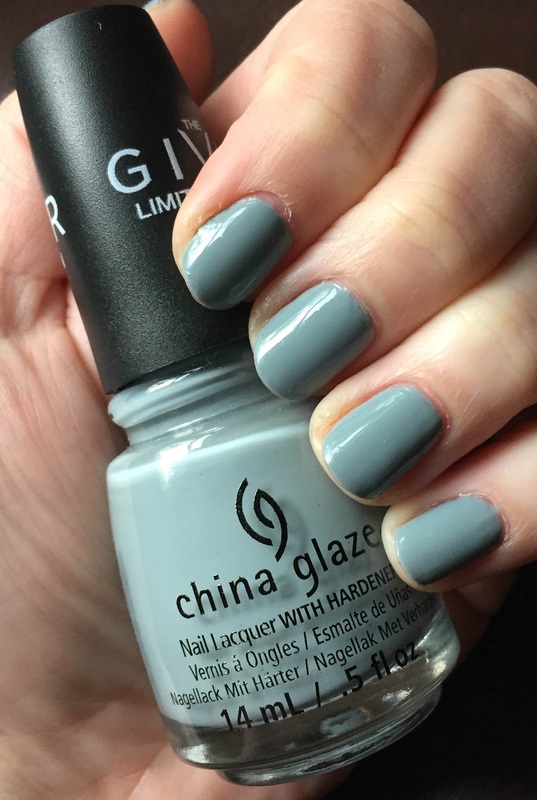 Back in December, I showed you my manicure with one of the colors from China Glaze's The Giver Collection for 2014, Release. At the time, I talked briefly about the impact that The Giver had on me. I also mentioned that I bought a second color from the collection: Intelligence, Integrity & Courage. I finally got around to wearing it all these months later! Intelligence, Integrity & Courage is one of those colors that changes depending on the light. It might be pale blue, it might be dusty green, it might be grey. The hybrid of hues makes it so interesting and adds such depth, which is so apropos considering it's inspired by a book and movie that are about precisely that. The formula is a creme that glides on effortlessly. One coat is enough for full coverage, but two lend a bit more opacity and richness to the color. I'm honestly obsessed with this shade. Ever since I painted my nails, I haven't been able to stop looking at them! Unfortunately The Giver Collection is no longer available, but if you happen to find this shade anywhere, I definitely recommend snatching it up. The Giver is one of my all time fave CG collections. The polishes are gorgeous. What a great shade for everyday use, and the one coat formula sounds amazing! That's awesome that it's one coat! What a gorgeous shade! It's unbelievable that you got full opaque coverage in a single coat! THis is impressive all the way around! I love the subtlety of this shade. It has a pretty dusty look to it. Opaque in one coat? that's absolutely good news! That's such a pretty shade! I would totally wear this all the time. This is a great cool gray shade for summer - it would be super fun to pair with some neon colors ! This is definitely a great gray shade. I have a hard time pulling that shade off often but this one I think I like.